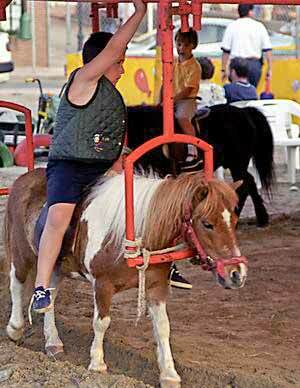 A common sight in fairgrounds and play areas around the coastal resorts of Spain, are the live pony roundabouts. 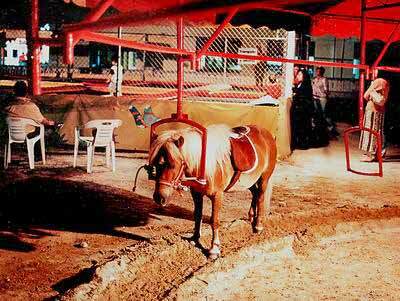 Small ponies are fastened into metal headpieces and are forced to work as parts of a living roundabout. They toil though the heat of the day until as late as three in the morning. The ponies carry a constant stream of riders and plod around continuously. Even if there is only one rider the others have to walk round and round as they are permanently attached to the machine framework. Some of the ponies are reputed to be cast offs from children that have grown too big for them. 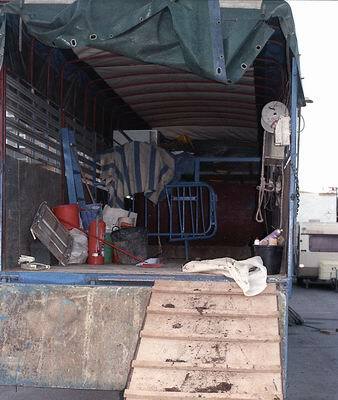 When something goes wrong with one of the ponies it is treated, as if a broken part of a machine, and disposed of.